- ImportedIngredients: Glycerin, Sclerocarya Birrea(Marula)* Seed Oil, Caprylic/Capric Triglyceride, C12-13-Pareth 4, Moringa Oleifera (Moringa)* Seed Oil, Ricinus Communis (Castor) Seed Oil, Isoamyl Laurate, Silica, Adansonia Digitata (Baobab)* Seed Oil, Vaccinium Myrtillus Fruit (Bilberry) Extract, Saccharum Officinarum (Sugar Cane) Extract, Acer Saccharum (Sugar Maple) Extract, Citrus Aurantium Dulcis(Orange) Fruit Extract, Citrus Limon (Lemon) Extract, Citrus Paradisi (Pink Grapefruit) Essential Oil, Anthemis Nobilis (Roman Chamomile) Oil, Eriocephalus Punctulatus (Chamomile Cape) Essential Oil, Tocopherol, Vanilla Planifolia Oil, Santalum Album (Sandalwood) Essential Oil. * Wild-harvested and Fair Trade. Responsibly sourced. Never tested on animals. Formulated without silicones, mineral oils, parabens, allergens, phthalates, synthetic fragrances, PEGs and SLSs. 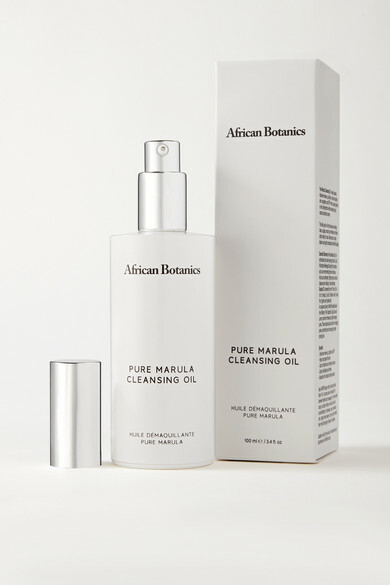 African Botanics' cleansing oil is made from sustainably sourced Moringa, Marula and Baobab oils. Rich in antioxidants and omegas, this lightweight formula penetrates the skin's surface to remove makeup, sunscreen and impurities. The result? Clean, supple and smooth skin that has a healthy and radiant glow.